Something just doesn’t add up with the Macro numbers here! My macros are set at 5/25/70 (21g carbs, 104g protein, 129g fat) with 1656 total calories to lose 2 lbs a week. I have been trying to do this for 2 weeks now and there is no way to keep that ratio and eat that amount in calories! EXAMPLE: By the time I would max out on carbs I have only eaten 1 1/2 cups of watermelon! Most days I eat less than 600 calories to stay in line with the 5/25/70 limits but I have not lost anything. I bounce up and down between 357 and 354. I feel like crap, I am always hungry, I crave chocolate and I HATE chocolate! I am battling constipation from hell. I am tired all the time but cant sleep, and I have a constant headache. I know part of my problem is not being able to walk very far due to a medical condition that has me bed bound but I do some exrecuse in bed, lifting hand weights and doing leg lifts. I just don’t see how anyone can eat 1656 calories a day and not go way over 21 carbs? It just doesn’t add up! fastblnd8228 you could be severely insulin resistant. I would personally avoid any fruit that isn’t a berry. Also if your always hungry, bulk up on more protein and fats each meal. Try not to snack, have balanced meals only. Your craving for chocolate is part of the detoxing and it can be brutal. Please put your scale away as it can damage our motivation. Your in it just a few weeks and unfortunately it sounds like your insulin levels are stubborn like mine were. If you have to snack add in nuts and cheese, just enough to take that edge off and whip some heavy cream and towards the end add in some sugar free choc pudding to help thicken the cream. Let that set a bit, and you will have a creamy delight. There are some great Keto friendly chocolates online also. You have to train your brain to avoid carbs that’s why you think you can’t eat all them calories and stay under 21 grams. Sugar can act like a drug to our bodies, hence the aweful withdrawal symptoms. I feel super sick in the beginning, and sometimes I had to move my carbs up to 30ish, and have some berries at night time. It’s a real bugger for some. If it’s too unpleasant for you and you can’t muster the 21, try changing the stats to 50 or so? Then ease into 21 after a few weeks. But, hide the scale for 1 month, your probably melting fat now and the scale isn’t reflecting as much. You will feel it in your jeans, etc. took me 2-4 month to see any results on the scale but I kept at it. My detox was over a month of symptoms and I thought I was dying. Nothing wrong with me doc said but I felt like there was. Hang in there, you can do this. If I had to do this process all over again, I would have started about 60 carbs and decrease by 10 every three weeks or so till goal carb counts. Your doing your blood sugar good by avoiding all high carbs anyhow, and soon your friends or family will see a difference before you do possibly! fastblnd8228 I had dreams of sleeping on a huge human sized pizza and eating it while laying down. That’s horrible ! fastblnd8228 Try using some laxitive tablets for a bit. It does take time for the intestines to wake up to lower carb. I used psyllium husk caplets now. First thing: watermelon is definitely the opposite of what you want to eat. It is almost entirely carbs . In general most fruits are out, with the exception of small amounts of berries and avocado. On keto, you'll find many traditionally healthy foods are NOT what you want, and the opposite to be true instead. My new go-to fast lunch is tuna salad: 4.5 oz tuna, half avocado, 3T mayo, splash of lime juice for a little zing. Give you 1g carb, 46g fat, 30g protein = 538 cal. It makes about a bowl full. Second, and this might be the answer to your calorie counting problem: when you say 600 calories, is that calories eaten, or net calories? If you have a fitbit connected or your phone tracking steps, it adds negative calories to the total and your goal should be more around 0 instead of 1650. But if you do this math: 4x carbs + 4x protein + 9x fats = calories consumed, you'll see that 21/104/129 (you said you are close to this on my thread) = 1598, very close to your goal! 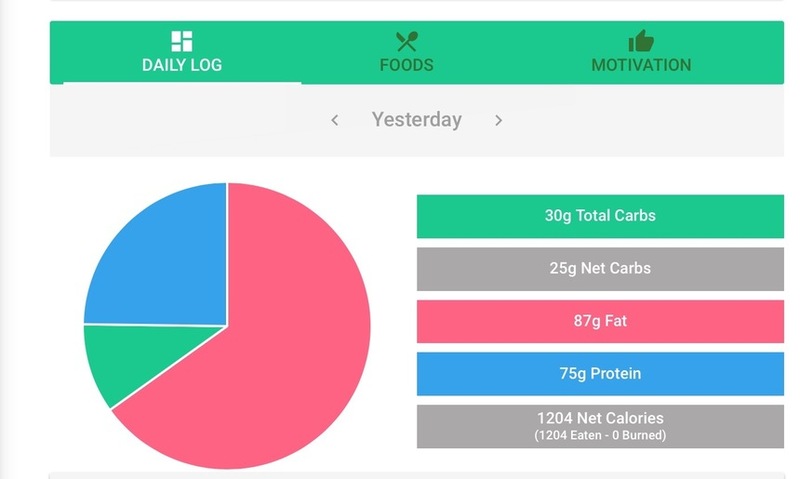 On the daily log screen, scroll to the bottom after all the food and see if there is a calorie value next to the exercise row. In parens means negative. Third: i haven't seen anything about the starvation mode you mentioned on the other thread in any studies I've read on the topic, it sounds more like forum anecdotes to me. I hesitate to dismiss it, but I don't put much stock in it. Basic physics says the energy to run your body has to come from somewhere, either food or fat stores. True starvation is when you have neither and the body consumes muscle and organ tissue as a last resort. That being said, you may be lethargic and less inclined to your usual level of activity, in turn burning/requiring fewer calories. Activity has to be a conscious effort in that case. Its been a novel, but hopefully there is something useful for you here. Badmojomn good suggestion but I cant with the heart, BP and cholesterol meds t must take every day. As a result of being bed bound for so long I had a heart attack 2 years ago after gaining back the 130 pounds I had lost the year before. Now I am literally a fat storage unit as being 2% mobile and 98% confined every calorie I eat my body stores. That’s what brought me to this Keto in the first place. After my cardiologist telling me I am in line for a massive heart attack, and my primary care Dr. Telling me to get high risk bariatric surgery, that I can’t afford ($64,000.00 to start and my insurance doesn’t cover one dime) or buy a diet book by some Chinese Dr, because he doesn’t know what to suggest, I have been left to find my own solutions. The one thing my cardiologist said was to limit fat and cholesterol intake to reduce arterial build up. So I feel like I am in a catch 22 situation here. I’m scared to do some of what it seems I need to do for this to work, but I’m scared that if I don’t find something to start getting this weight off soon I’m just going to die anyway. I am just losing all hope here. I have been at this almost 100 days now and I have not lost anything. I started out counting calories only and when that got no results I moved to Keto with no better results. Either I am far more broken than I know or I am just a complete moron with a fat trapped brain. What I need really is to find someone who can just create budget minded, simple to make, 2 week menu for all my meals. One that tells me exactly what to eat and when. As long as it’s normal food , I’m good with eating that menu forever. I have never needed much variety it’s just easier to budget, buy and prepare when I know what’s coming. But I have no clue where to find anyone who would do that for this Keto thing. I eat 1600 calories a day and I rarely go over 10-15 carbs, even though I'm allowed 20. You just need to eat more fat. Fat = calories. It is also satisfying and keeps the hunger cravings away. For example, my breakfast is always the same. I eat 2 eggs, 2 ounces of breakfast sausage, 2 slices of bacon and my eggs are cooked in butter. That breakfast alone comes out to 531 calories with only 3 net carbs. There are other meals I eat, my problem is usually getting too much protein rather than carbs. As for your heart problems, I'm not a doctor and can't give you medical advice, but I started this diet in large part to having high blood pressure, and the research I've been looking at suggests carbs are what's bad for hearts, not fat. Have you checked out the movie "The Magic Pill" on Netflix? Also there is a movie called "Fathead" that tackles a lot of the myths(aka straight out lies) about heart healthy diets(they actually cause the problems). fastblnd8228 do you have diabetes? This is very odd if your following a low carb diet and fat hasn’t came off. For now, focus on no fruit that isn’t a berry, no fruit juices, no artificial sweetners. Put it this waY, the theory of ketogenic is to eventually reduce blood pressure and you should be able to kick bp meds. With the build up, that’s already there because your vessels are not in good health hence high bp. The plaque starts to build up on the walls because of this and I don’t think ketogenic can reverse the plaque build up but should eventually reduce the bp. Im sure you have a bp Monitor on hand if not get one(cuff). If you tried first lower carb like a diabetic diet and calorie restriction, maybe this will help. Eat tuna, all the meats and lots of green leafy veggies- do not use low fat dressings. These are terrible for anyone. Make sure carb is low on them however. Think 100 or less net carb a day and see how you do. I woood avoid all white flour, heavy starched like root veg (potato etc) no rice or legumes. I see your not possibly able to cook much but this is so important to eat even a lower carb and stick to it, no matter what. The cholesterol meds are working so maybe more chicken baked, fish, baked meats with veg. I guess your not alone as we had another immobile almost person due to back issues or something and she lost quite a bit on Keto. If you google Coronary artery disease with ketogenic diet, see what you can find. Maybe ketogenic does help heal some plaque, I haven’t got that far, but put it this way, bariatric surgery isn’t the magic bullet. They will ask you to follow a low carb diet for awhile and want you to take off some fat. Also, with your heart condition, A) not sure they would risk that B) I would fall over if they did. That’s an invasive procedure in itself, let alone risky to someone with major heart disease. I would not do it in your condition, but perhaps you can do a nutrion consult and see where your own personal issues are. Some counseling may help also. Remember we eat to nourish our body, not our emotions. That’s one thing I have to remember 5 times a damn day. I’m a food addict and that’s okay, but I have to look at food in a whole new light now or I’ll be on that 600 pound life show trying for a hail marry. Take your food in your control. Remeber, some docs, well a lot of them, don’t like ketogenic because it’s making people healthier. Guess what. They can’t push the meds and get kickbacks when we get healthier. My dentist told me, all the doctors at his convention do not take statins because they do more harm than good. Your plaque is essentially due to your condition of your vessels. Once weight comes off, due to low carb, blood pressure should start to normalize, in theory. Check out heart disease and ketogenic. I think you may be surprised. 1 thing about your weight loss is that you could be burning fat, but then the fat cells fill up with water and hold onto water. So even though you are burning the fat, you still maintain the weight and size while it holds that water. Then there is a point when that water is released, and you'll suddenly drop multiple lbs and your fat will shrink up a bit. You can google "The whoosh effect" for more info. EvilEngnr thank you for all the info. To answer your question when I said 600 calories I mean that it’s 600 under the set budget. But there are days (at least 2 days a week) that I only eat between 400 / 700 Total calories a day. In part because I just can convince myself to eat more without getting sick. Badmojomn this is what I have been eating for the last 5 days. The fat used in the Brussel sprouts is bacon fat. I tried coconut oil but prefer the bacon fat for taste. I will switch back and forth if I need to. I use the lettuce leaves to make a rolled sandwich. The egg salad is my “mayo” substitute (it’s made with 12 cage free eggs, 4 tablespoons Mayo, 1tsp minced garlic, 1 tsp minced onion, kosher salt, black pepper, 1/8 tsp paprika ) Swiss cheese, pepperoni slices, bell peppers for crunch. I couldn’t get Breakfast in the picture too but all I have is 1 cup of coffee with 1 tbls of heavy cream. Badmojomn here is the break down for the above. I try to get most of my carbs from leafy greens and a little vegetable. I make a "salad dressing" of 1/4 of an avocado, 2 slices of tomato, 2 slices of cucumber--all 3 roughly chopped up, plus 1 tablespoon of olive oil and 1 tablespoon apple cider vinegar--I shake it up in a sealed container, then put it over 1 to 2 cups of lettuce or fresh spinach. It makes enough creamy fluid to make the salad very tasty. I was having a hard time getting enough flavor-liquid to make the greens moist, but this fixed it for me, and it's a fair amount of food with only 4 or 5 carbs. Then I add protein and fat to bring the meal into proportion. Always check with your doctor to be safe, but if you think you're retaining water, try getting some carbs from asparagus-- a natural diuretic. 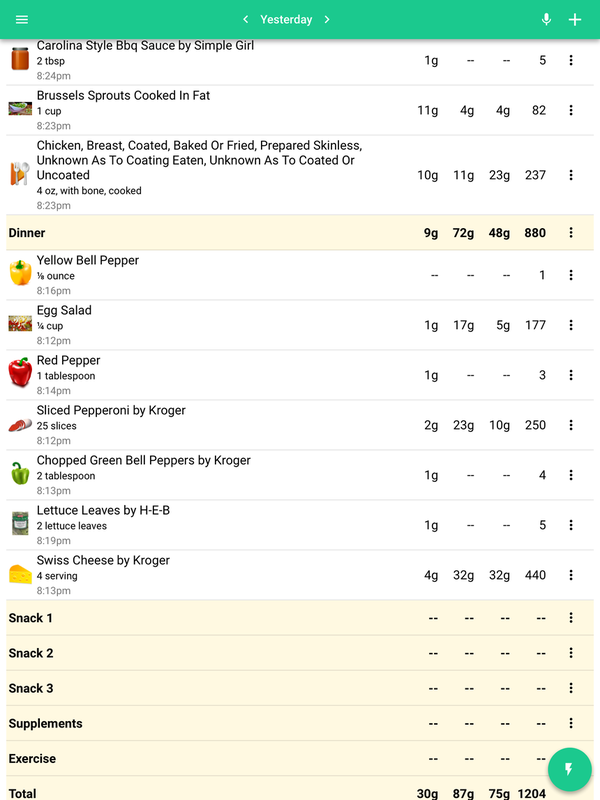 The app has a feature for making up a meal plan for a week--have you tried it? It's not perfect but maybe it could help you get on the right path. It's under the food section, then "recipes and meal plans", choose a meal plan and it gives you the meals. I am following this to see if I can offer any advice. I hope there will be a "whoosh effect" mentioned in the comments, and you will stay motivated. Losing 2 pounds a week is still good, but I know your frustration as the larger you are, the bigger the losses should be at the beginning. You mention meds for cholesterol and BP. Some of them may be making it harder for you to lose weight. Research them online to see if others have an issue with them. If so, consult your Dr. about alternatives to help you lose weight. Your feeling bad w/ headaches/constipation et al has me feeling your are still in the "keto flu" phase. Even though I knew about issues with electrolytes and tried to prevent low levels, it took 11 days to get over keto flu when I reduced carbs a few years ago. When it was over, I knew it. Energy levels were great and my brain fog went away. Magnesium, one of the electrolytes we need to bolster when going keto, is know to act as a laxative. If you are low on electrolytes (magnesium, potassium, sodium and calcium), making sure they are replaced will help for sure, and hopefully with constipation. I am keto now for about a month, but I had been low carb (under 50g a day) for a few years. So I already went through the cravings and change of food before. The cravings went away for me even at that higher amount of carbs. It took months though, but it will happen. Your sample day seemed good, and not something that can cause a problem. But it may be you have to reduce carbs more than others because of more metabolic damage or your unique intolerance for carbs. Trying something like an "egg fast" to eat a simple ratio of fat to protein for a short while (it is meant to be temporary) may jump start your weight loss. As far as exercise, I do it now to build stamina, strength and strong bones. But I didn't go the gym AT ALL when I lost about 100lbs on my initial low carb diet. Even in bed, your body has to burn calories to keep your brain going, and to keep all your other organs fed. I would consider exercise when you feel a bit better and feel the desire for it. Your diet (in the sense of foods you eat) is the biggest source of change. Losing weight itself will probably help you with your BP and reduce or eliminate that medication. fastblnd8228 Try not to eat breaded chicken. Slow baked chicken of your choice with sprinkles seasonings is always yummy. I put ranch powder, black pepper and garlic onion powder and dash of salt. Bake on cookie sheet low temps about 350 then turn it down a bit after it gets a good golden color, turn down to 275 or so uncovered until it basically falls apart. I think your stats look good, I think for your starting weight you need more calories. If you can eat larger servings of protein and fats, can you eat avacadoes or guacamole? I know they are spending but consider them your ultimate food source. If your not able to eat more calories, I guess I want to say keep going. Your possibly severely insulin resistant and this way of life takes time for some to respond to. 1: don’t let yourself be constipated. You may have to reply on some stool softeners for a bit but psyllium husk pills worked great for me. Get some more celery in if you can- with low carb dips or cheese spread. Constipation will make you sick in itself. I have noticed Brussels are high in carb but oh so good. I think if you give it more time, it will turn it’s head and start working if your truly in the 30 gram and under mark. Try to even the fats, and proteins, if your not hungry, that’s okay. I do think the calories is low, but if you can increase them per meal that would maybe work. Try some fatty meats like good grilled steak rib eye and dip in butter and or real mayo. I don’t want you to get discouraged yet, I think your metabolism will turn around. Make sure your not taking in any flour, crackers even a couple will throw you off. I know what a budget does on this diet and trying to find chicken thighs with the skin and bone on sale is difficult so I’ll have to pay full price. I use and left over chicken and cut it up to make chunky salad with loads of celery next day a dash of Helmans mayo. I know this will work for you, don’t give up. Make sure your talking with doc about the meds for the bp and heart. Salt is an essential part here and you have to find the sweet spot though. Hang in there. I think your doing well just need to give it more time and focus on fats and possibly a bit more proteins. I think once you hit a month or more in your going to start to see a bit more fat loss. I didn’t see much until month 3/4 then it seemed to come off quickly. Hang in there. It will work. Try to not weigh in to often. Set a date like in 3-4 weeks and every 3-4 weeks after that. Remember the bp pill is used to take off water to bring down your bp, so it’s going to be a bit tricky keeping your sodium in and will be really important to keep your water drinking going. I think your doing good even though you may not feel good but if you keep multi vit, fluids, and ask doc about potassium because some heart conditions need less potsium because it exacerbates the conduction if the heart rates. Hopefully soon you will be able to kick the bp meds. Keep us posted. fastblnd8228 The pics didn't show up for me yesterday (internet issues...), but they do help. You can see where your carbs are, and you can see how to adjust your diet to be lower carb/higher fat & protein. Put in what you'd like for your meals for the day, then adjust the amounts you'll eat of each item to meet the right macro balance--then prepare your plate. Eat 1/2 cup brussels sprouts cooked in fat instead of a cup, and you'll only add 4 carbs (according to the entry I see in the app--which also indicates that 1 cup would be 7 carbs when I put it in so the 11 carbs pictured confuses me), and you can add something else to the meal. This will allow you to get more variety in your carbs and keep your meals interesting. Badmojomn is right about the chicken being breaded--nothing with breading, flour coating, etc. That will just bump up the carbs and limit how much quality vegetable you can eat. I weigh and measure everything, sometimes putting together two or three plates in the fridge so I can just have the math already done. That way one night's dinner gets copied to the next day's lunch (in the app) which is already pre-measured and I don't have to think about what to eat or do any extra prep/calculating. For the constipation--check with the dr/pharmacist, but glycerin suppositories can often help and since they aren't oral I think they generally don't have the same types of medicine conflicts as other methods of relief, and be sure to be drinking enough water. Following this stream it seems most your concerns have been addressed. All but 1. I understand the frustration of being bed bound but you can't make it an excuse for not losing weight. My history: I'm a quadrapaligic so no I don't exercise. Laid in bed feeling sorry for myself until I was a balloon about to burst. I have been doing keto for approx. 8 months now ( on this app done Jan. 1) and have lost 68 lbs. I still have more to go but because I feel better, it's easy to get the food required, I'm not hungry all the time, etc. I plan to make this a lifestyle not a diet. I too have chronic constipation due to inactivity and pain meds. After being hospitalized the 2nd time a doctor suggested polyethylene glycol. Safe to use regularly vs. Typical laxatives. (I get mine from Wal-Mart under name Clearlax as its the cheapest I've found). I just put a cap full in my water bottle each morning...totally tasteless. Since you have a lot of health issues you might want to run it by a doc first but its changed my life! linrenep Are you sure you want to take that? It’s not natural? See below : I’m just curious but being quadriplegic, you may have needed a stronger stool evacuator, and personally if this was the only thing that worked for me, I wouldn’t touch it. Badmojomn I know and hope I will be able to get off it but after years of this issue followed by surgury, at this point I'm willing to take anything that works! Thanks for thinking of my health though. linrenep I understand. I hoped maybe you were just prescribed that because I know doctors just push certain things. Badmojomn I also just ordered some more Lilly's choc bars. They help if I eat to many ( not that I ever would, lol). linrenep Oh yes! Lol! Been there done that!